How often are the star ratings updated? Star Ratings are updated at least four times per year, generally in early March, June, September and December based on the previous quarter’s financial information. Why can’t I find my bank or credit union? Leading articles are removed, but aside from that institutions are listed exactly the way they file their call report . As a result, if you looking for 1st when the institution files as First, you will not get a match. Try your search without entering the state OR try by only entering the state. These searches will get you more than you bargained for, but the institution you are looking for will likely be in the mix. It is possible for foreign banks to have FDIC-insured U.S. branches. We do not have data on foreign banks. You may call the FDIC at 1.877.275.3342 or visit the FDIC‘s BankFind to find out if your bank is a foreign branch or a new bank in the last few months. How are star ratings assigned? Each institution files a quarterly Call Report with government regulators. Bauer performs its own, independent analysis on the data supplied and supplements that with historical and other data to assign comprehensive star ratings. 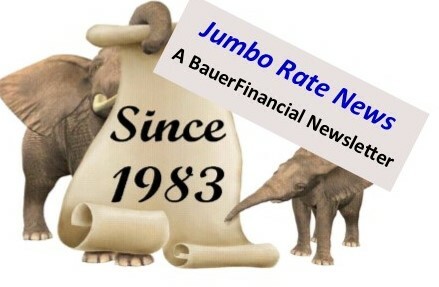 What is the significance of the elephant on Jumbo Rate News? If all banks and credit unions have federal deposit insurance what difference does its rating make? Consumers (and businesses) that exceed the deposit insurance limit could lose some of their money in a bank failure; it is surprisingly easy to go over the insurance limit without realizing it due to interest payments, proceeds from the sale of a house, retirement accounts, death of a signer on the account, conditional clauses in trust documents, brokered deposits, etc. Additionally, an acquiring institution is not obligated to keep paying CD rates at the rate contracted with the defunct institution. Interest rates are subject (likely) to drop, especially if they are above the market averages. Businesses have another concern; if their bank fails they can lose their “line of credit” (source of funding) until they are able to find another lender. Regardless of insurance limitations, individuals and businesses could be subject to disruptions in direct deposits if a bank is closed with no acquirer. The same goes for any bills that you have automatically set up to pay from your checking account. The rating went down from last time. Does that mean the institution is in trouble? Institutions rated 2-stars and below are relegated to our Troubled and Problematic Bank Report or our Troubled and Problematic Credit Union Report. For more information, you may want to purchase a Highlights Report that will show trends over the last year. Do banks and credit unions pay to be rated? No institution has ever paid for its rating, nor can any institution elect not to be rated. Bauer rates all U.S. chartered banks and all federally insured credit unions with assets of at least $1.5 million. How can I find the best banks and credit unions in my area? Search by selecting only a state – leave the institution name field blank. The search will return all the banks (or credit unions) in that state in alphabetical order. Or you can order Your Hometown Bank Ratings Report for information on all the banks operating in your county. What if I want more than a Star-Rating? Click on the “Tell Me More” button next to the institution’s name. Bauer provides reports with as much, or as little, information, as you desire. If you don’t see what you want, call us at 1.800.388.6686. Why are Puerto Rico, the Virgin Islands and other territories listed? Although they are not states, Puerto Rico and the U.S. Virgin Islands are U.S. territories and share all of the benefits and guarantees of FDIC insurance. Do you use the CAMELS rating system? The CAMELS rating system is the regulators’ own proprietary system and is confidential. However, Bauer takes a similar approach in assigning our star ratings. What makes Bauer different from other rating agencies? BauerFinancial is completely independent. It does not get paid (nor has it ever) to rate any institution, nor can any institution avoid its rating. Bauer does sell products to institutions and encourages them to advertise their 5-Star or 4-Star rating, but they must earn it first. Bauer uses the same strict barometer to rate all banks and all credit unions and makes those ratings available to all people—for free—on its web site. Bauer has nothing to hide. Since 1983, this practice, along with an excellent track record, has earned the respect of regulators, bankers and consumers across the country. We have been analyzing and reporting on the industry since 1983. Nobody knows this business better, nor is better respected. Banks and credit unions can both carry federal deposit insurance (FDIC for banks; NCUA for credit unions). Without federal deposit insurance, an institution will not be rated by Bauer. FDIC and NCUA carry the same guarantees and are both backed by the Federal Government. What primarily sets banks and credit unions apart is their ownership. Banks can be owned by stockholders, individuals or groups. Credit unions are not-for-profit entities, owned by their members. The allegiances vary according to who owns the institution. What is a Banker’s Bank? A banker’s bank is a bank for banks. Unlike regular banks that have a customer base made up of individuals and businesses, a bankers bank has other banks as its customers and provides a number of correspondent services for them. What is a Corporate Credit Union? A corporate credit union is a credit union for credit unions. Unlike regular credit unions that have a membership made of individual or “natural” persons, a corporate credit union has other credit unions as its members. Any person, agency, or association that is in charge of watching over money for someone else, has an obligation to make sure it has, to the best of its abilities, determined that the place it selects for those funds, is strong. This process is known as “Due Diligence”. Visit Bauer’s Due Diligence Report for more information. Does Bauer Provide Ratings for Letters of Credit or Bank Guarantees? When it comes to obtaining a Letter of Credit (LC), a Bank Guarantee (BG) or even a Line of Credit, it is important to remember that they are only as good as the bank that is providing the assurances. To make sure that the bank you select is credit-worthy, we suggest you purchase both a Due Diligence Report and an Analytical Report on the bank. The Due Diligence Report provides a balance sheet, income statement and several ratios comparing the bank’s performance for the current quarter to its performance during the corresponding quarter a year ago while the Analytical Report provides peer group comparisons and further breakdowns. Both reports include the bank’s current star rating. 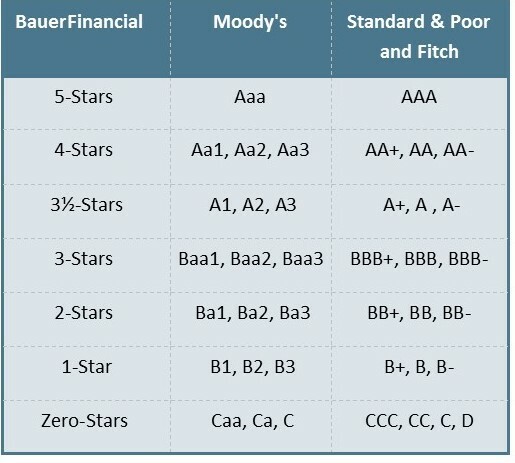 Is Bauer like other Rating Agencies I read about (like Moody’s and Standard and Poor’s)?